Low level working at height is one of the fastest growth areas for powered access – which is one reason why the Genie GS-1932 scissor lift is so popular. The machine is the Product of the Month for April to highlight the versatility and safe working at height delivered by the scissor lift. 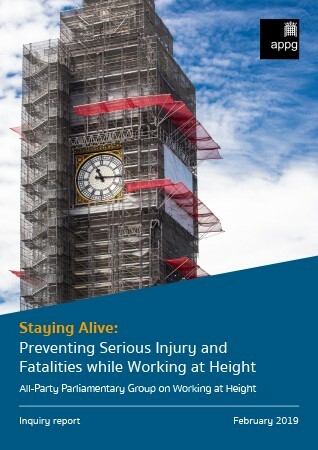 Unfortunately, some companies and contractors are sticking to outdated ways to work at height, which are both unproductive and potentially extremely hazardous.MPs has just released a report – Staying Alive: Preventing Serious Injury and Fatalities While Working at Height – that warns of these dangers. The All-Party Parliamentary Group on Working at Height points out in its report that 35 people died in the workplace in 2018 as a result of falls from height. It was the most common cause of workplace deaths. In some sectors, such as the food industry, falling from ladders was the most common examples of falls from height. 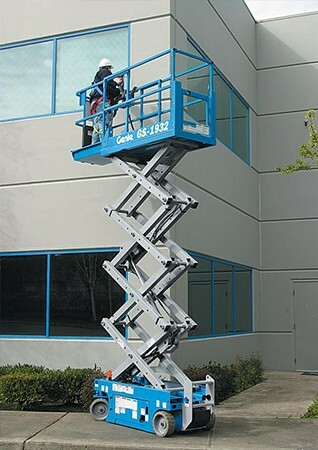 The Genie GS-1932 scissor lift is a big part of the solution. It can all-but eliminate fall risks associated with working at low height, alongside other access equipment, such as low-level aerial booms and personnel masts. 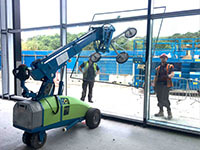 The Genie GS-1932 scissor lift is easy to manoeuvre in tight spaces, provides quiet electric, zero-emissions operation and can be used for both indoor and outdoor applications. 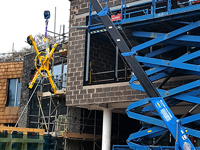 The mobile elevating work platform (MEWP) has a maximum working height of 7.8 metres, making it ideal for a wide range of applications at low to medium height. 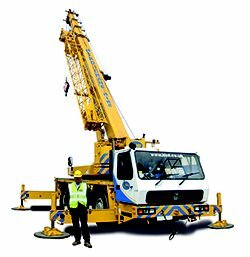 Its large platform working space, and 0.91m roll-out platform extension, has a lifting capacity of 227kg, so has the capacity to carry an operative along with plenty of tools and materials, when needed. A key benefit of the Genie GS-1932 scissor lift is its width of just 0.8 metres, which means it can be guided through a single doorway. While its zero inside turning radius makes it easy and safe to use in confined spaces. Scissor lifts deliver productivity benefits that set them apart from other working at height solutions, such as mobile scaffold towers. The Genie GS-1932 scissor lift can be controlled safely by one operative, with fast relocation and set up for completing multiple tasks across a large area. This makes them ideal for tasks such as lighting maintenance, building inspection, and electrical and mechanical equipment installation. The additional productivity of scissor lifts often offsets the additional cost of using powered access instead of tradition (and outmoded, in our view) method of working at height, such as ladder systems. Providing employees with a safe and fast way to complete tasks is also good for morale, supporting retention of key personnel. Preventing falls which could result in six of seven figure fines and criminal prosecutions also makes a great deal of business and financial sense. 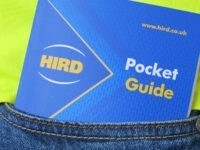 As part of its hire service commitment, Hird will advise customers looking to upgrade their systems of work on the best working at height solutions to control cost and maximise productivity. The Genie GS-1932 scissor lift is one machine out of many in the Hird powered access hire fleet that could form part of the right solution. 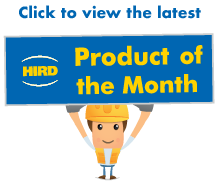 To find out more about our Product of the Month for April, the Genie GS-1932 scissor lift, and IPAF operator training to use it, call the Hird powered access hire team today.